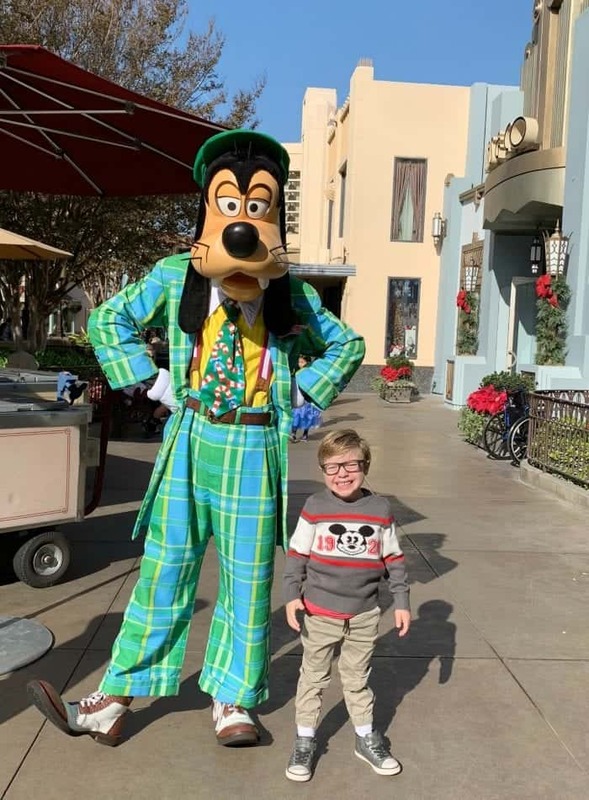 Once or twice a year I try to take my boys to Disneyland Resort one on one and really spend some quality time together. It’s been one of my favorite traditions since my oldest boys were toddlers. 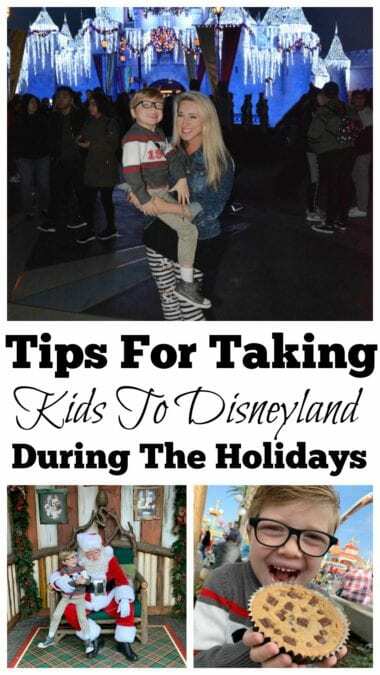 Today, I’ll be sharing my tips when taking your little ones to the Parks this magical time of year! 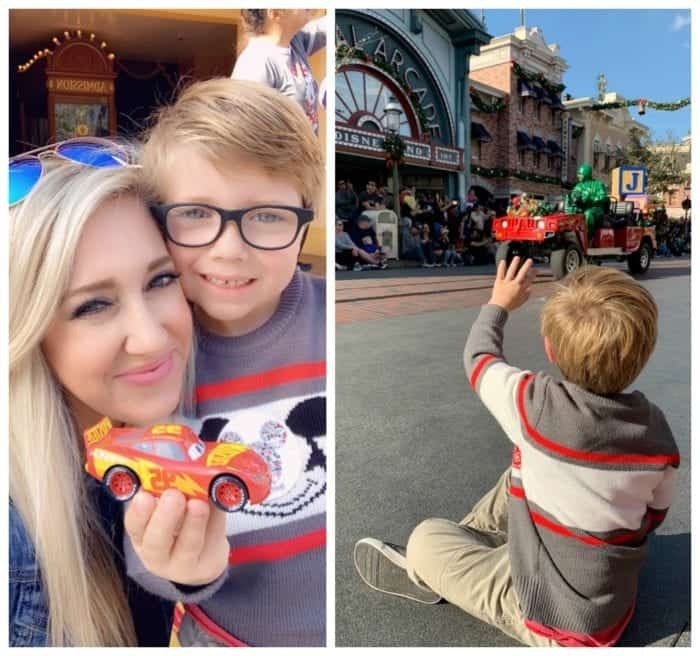 Disney Photo Pass is such a great thing to take advantage of at the Parks! When you’re with the kids,try to get your photos done when you notice “shorter” lines. I don’t know about your kids, but mine do NOT like waiting in lines for photos. Pax and I passed by the gorgeous Christmas Tree at Disney California Adventure and saw it hardly had a line, so I got this one done nice and quick. The photographers will hand you a photo card or scan your AP that will store all of your photos for you to enjoy. There are dozens of beautiful photo opps this time of year, keep your eyes open for the many Disneyland Photographers around the Parks. Many of the Disney Photographers will have you do magic shots without even asking, but just in case don’t forget to ask for it. The photos are hilarious and such a fun keepsake. Around both Disneyland Park and Disney California Adventure Park you’ll find your favorite Characters dressed in fun Holiday costumes. Ralph Breaks The Internet’s Vanellope and Wreck it Ralph are now in the Hollywood Land Backlot area of Disney California Adventure Park. Over at Disney California Adventure Park’s Grizzly Peak, you have to see the giant bear near Grizzly River Run. His sweater even lights up at night. He’s too cute and makes a great photo op! Also in Grizzly Peak, there’s Redwood Creek Challenge Trail where there are so many fun activities for the kids to do. 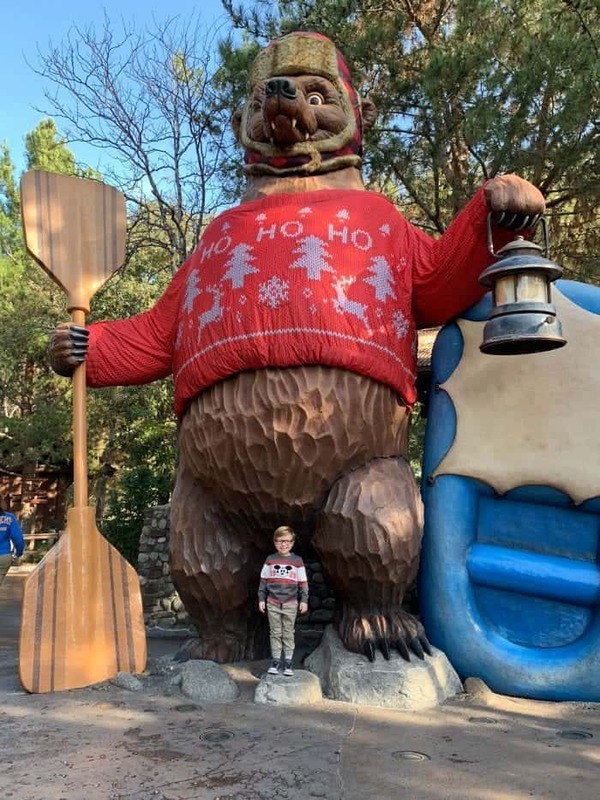 This is where the kids can meet Santa at Disney California Adventure Park. Great area to sit and let the kids play. 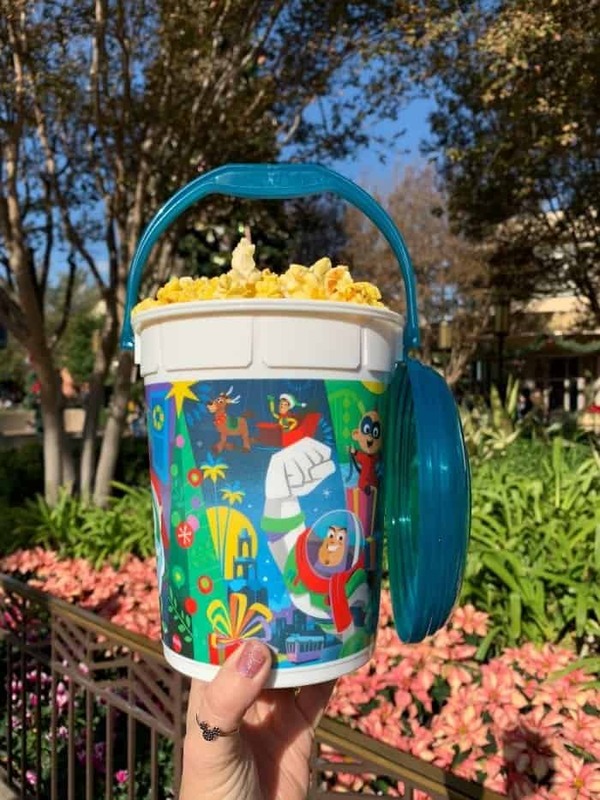 Pax and I couldn’t pass up the new Holiday Popcorn Bucket at Disney California Adventure Park! That popcorn smell at Disneyland Parks is one of the best smells on earth, lol! This bucket was $9.00. Cars Land During The Holidays Is A MUST! You have to take a stroll through Cars Land both during the day and night to see the magic going on there. 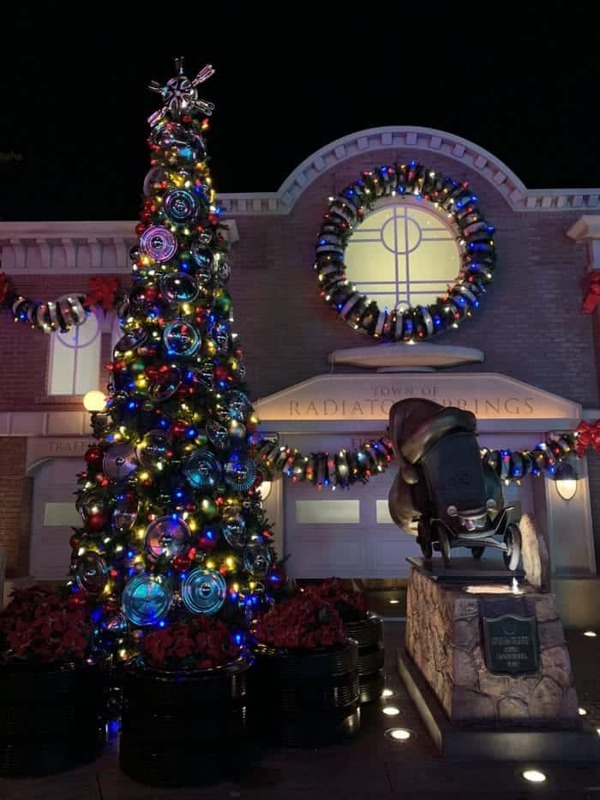 The decorations are car themed, colorful and fabulous! The Magic of Pixar Pier! Pax and I had so much fun enjoying Pixar Pier together. 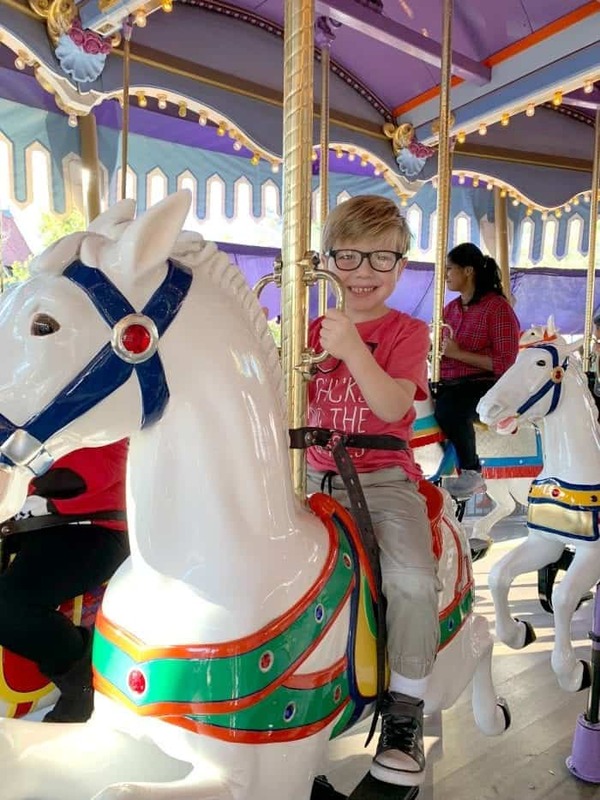 While he isn’t quite tall enough to ride Incredicoaster, we enjoy Toy Story Midway Mania as many times as we can. His absolute favorite! 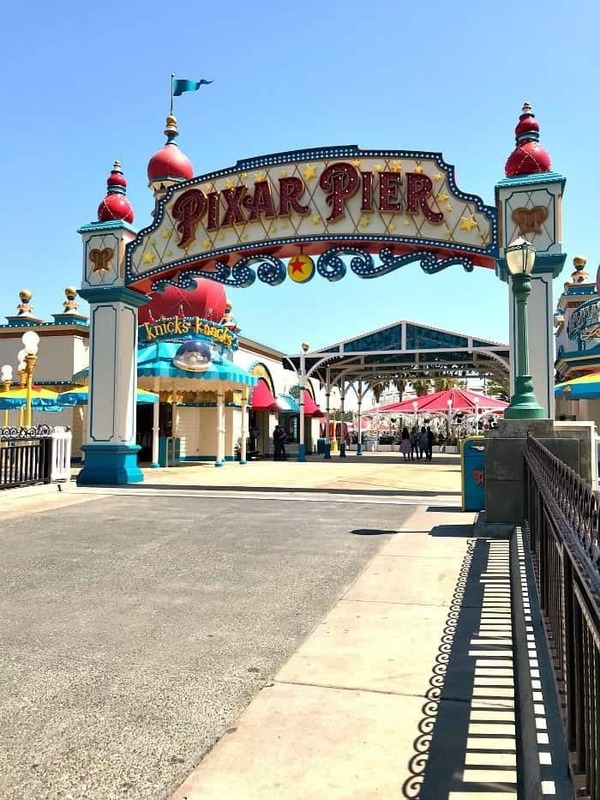 Be sure to read my Guide To Everything Pixar Pier if you are visiting for the first time! I’ve mapped out everything you don’t want to miss! 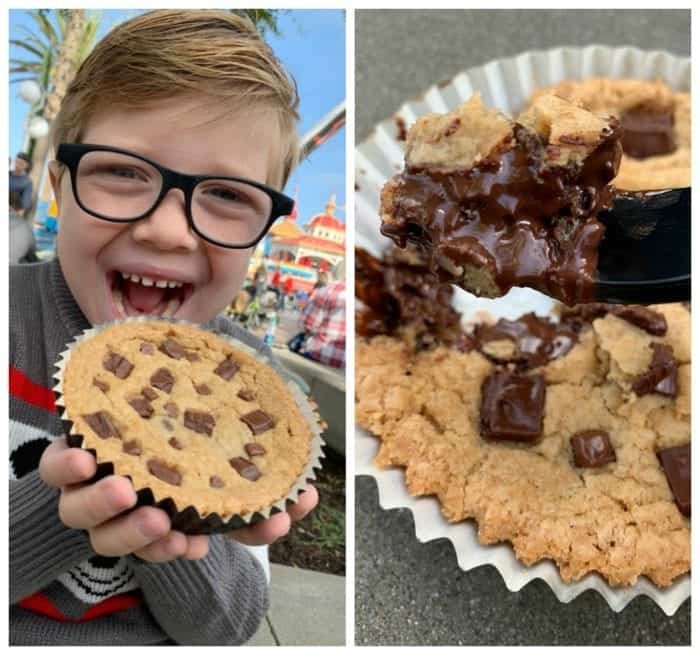 Check out my blog post What To Eat on Pixar Pier for so many delicious options! 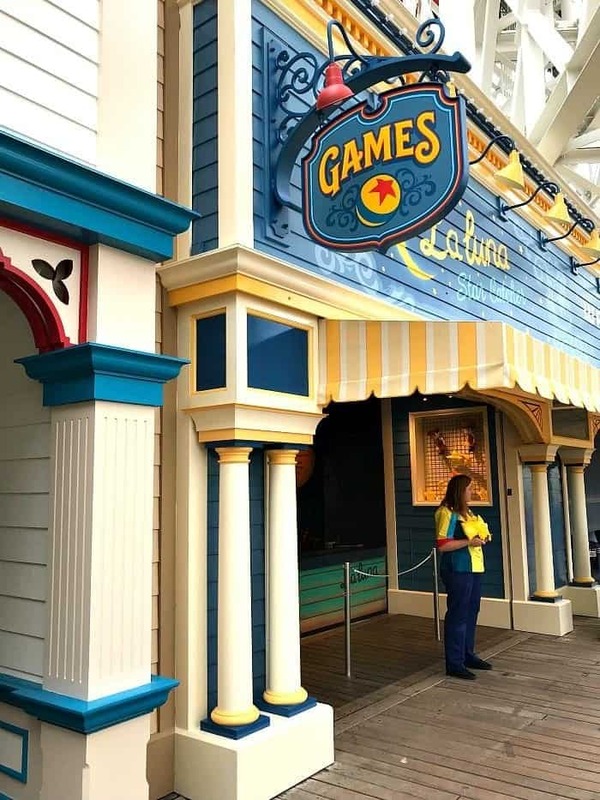 All three of my boys LOVE to play the games on Pixar Pier. Be sure to check it out!! There’s rarely a wait, so this is a nice time to take a break from waiting in lines if needed. 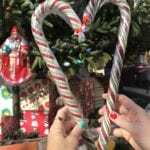 If you haven’t had a Disneyland Candy Cane before, you are in for a treat! 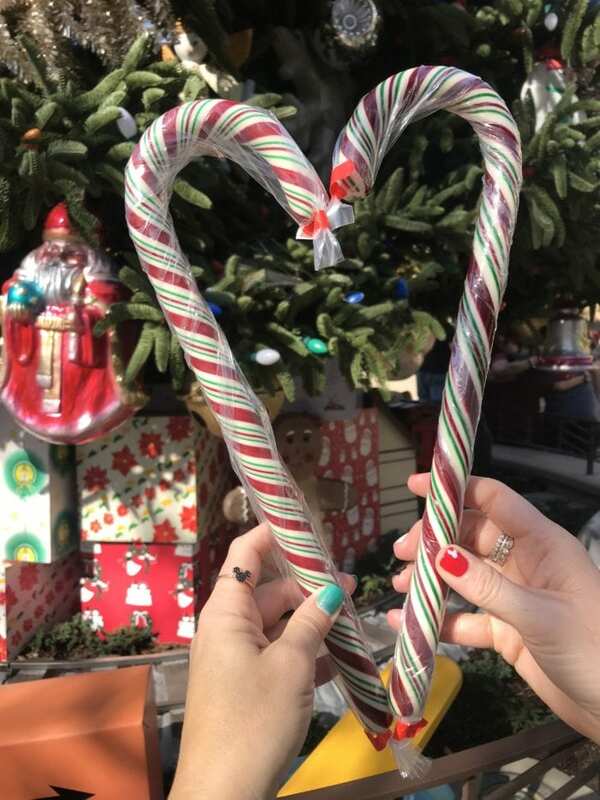 The candy makers make them right in the Disneyland Kitchens and they are the most lovely candy canes I’ve ever seen. I’ve listed all of the dates and some details on THIS POST. Don’t miss the stunning Christmas Tree on Main Street, U.S.A. It makes the perfect photo op and is absolutely gorgeous! Around 5pm every evening there’s a quick tree lighting ceremony that takes place. The whole Park around Main Street counts down and watches the Christmas Tree lights turn on. It’s one of my favorite things actually. Don’t miss it! 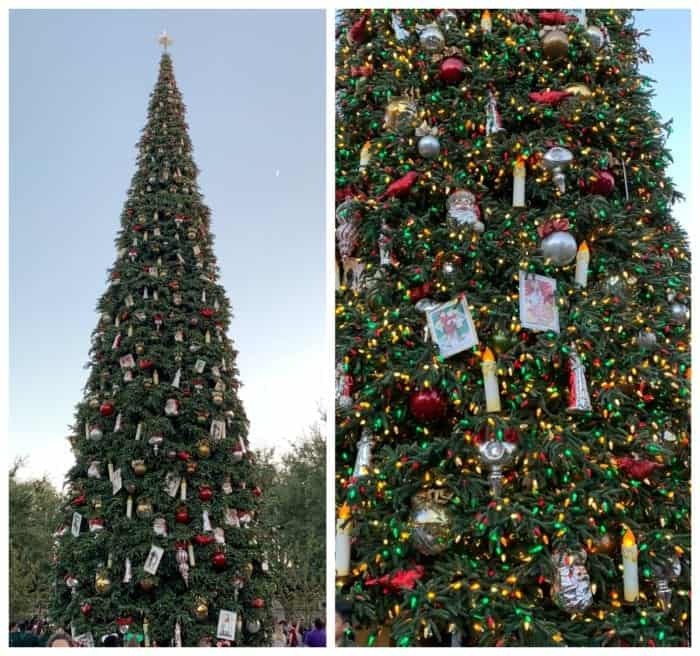 This also happens at the Christmas Tree at Disney California Adventure Park! I look forward to A Christmas Fantasy Parade every single year. 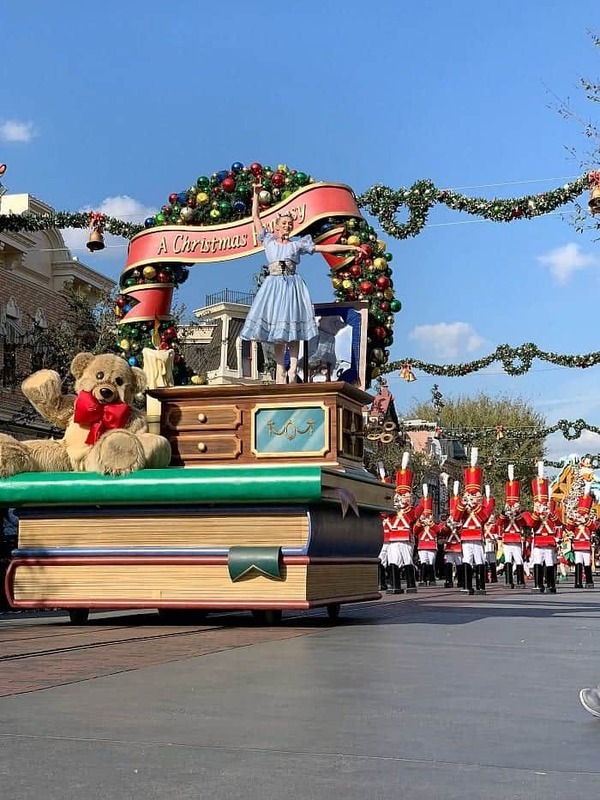 The music, festive floats and characters are the best. How Early Do I Need To Save A Seat For The Parade? Be sure to plan early to get a good seat. I’d recommend finding a seat at least 30 minutes before the parade starts. Many people will start finding their seats on Main Street an hour+ before the Parade start time for your reference. I always pack a light blanket that I can set out for the parade plus some toys for Pax to play with. He was occupied with his Cars toys while we waited. 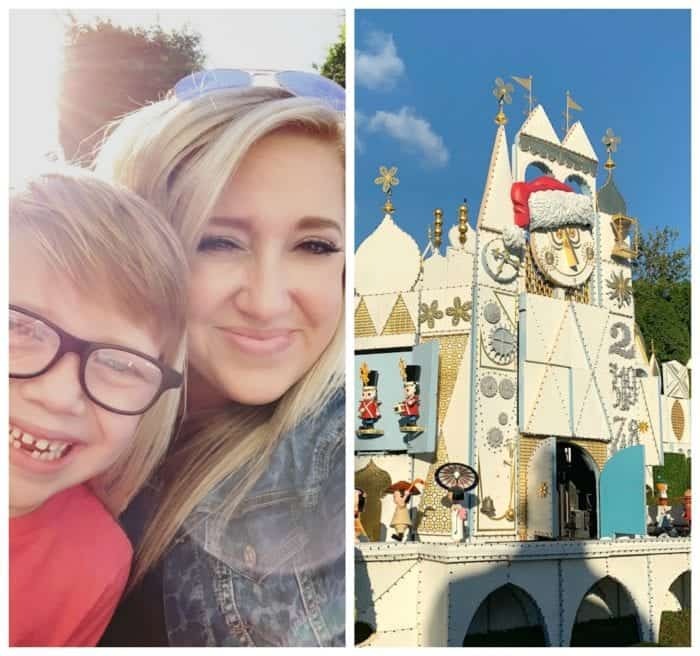 Pax and I had a blast going on all of his favorite attractions. For your little ones, Fantastyland is where it’s at! King Arthur’s Carousel is magical along with all of the other favorites! “it’s a small world” Holiday is another favorite of ours! It’s completely decorated for Christmas and the dolls sing Christmas songs! We love it. 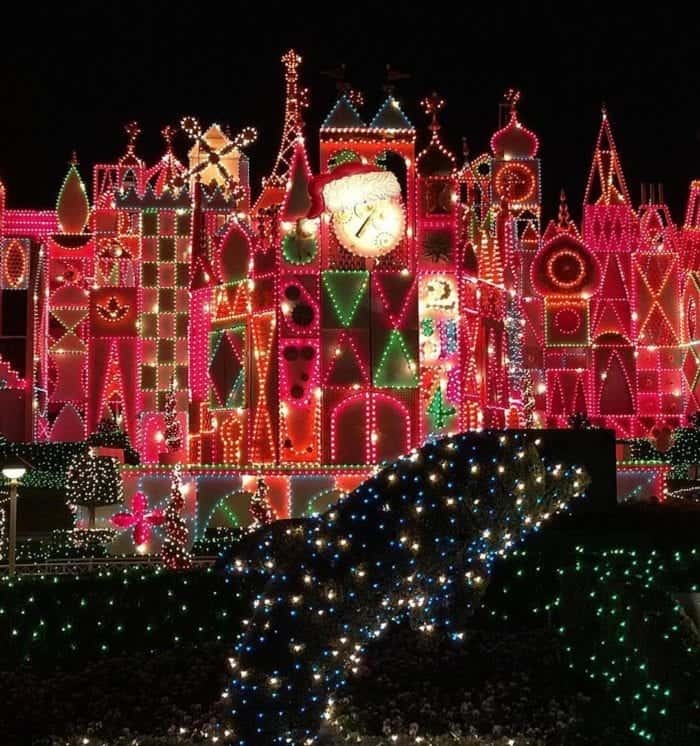 Every 30 minutes throughout the night, watch in wonder as a joyous light projection show animates the façade with a kaleidoscope of charming holiday colors and images. Haunted Mansion Holiday is also a MUST! Jack Skellington and pals entertain throughout the entire ride. It’s amazing. 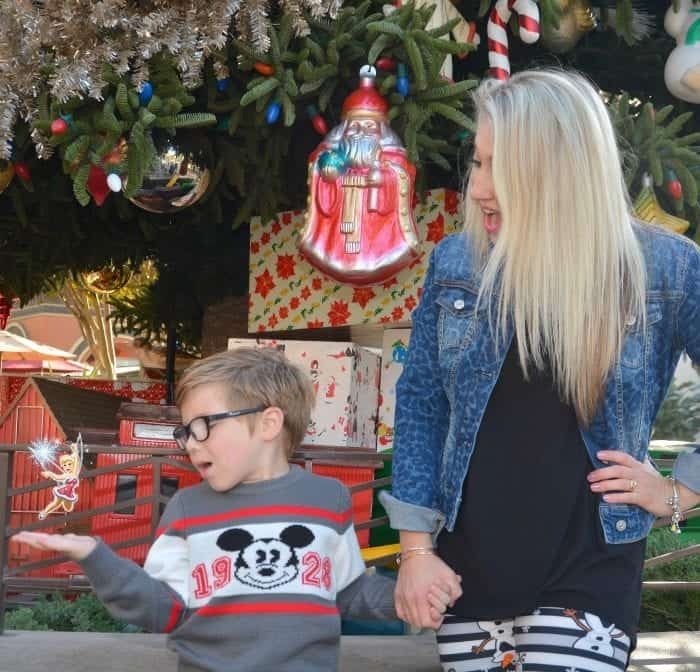 Another MUST this season with the kids is “Believe…in Holiday Magic” Fireworks. As described from the Disneyland official website: Feel your spirit soar during this splendid pyrotechnical spectacle. 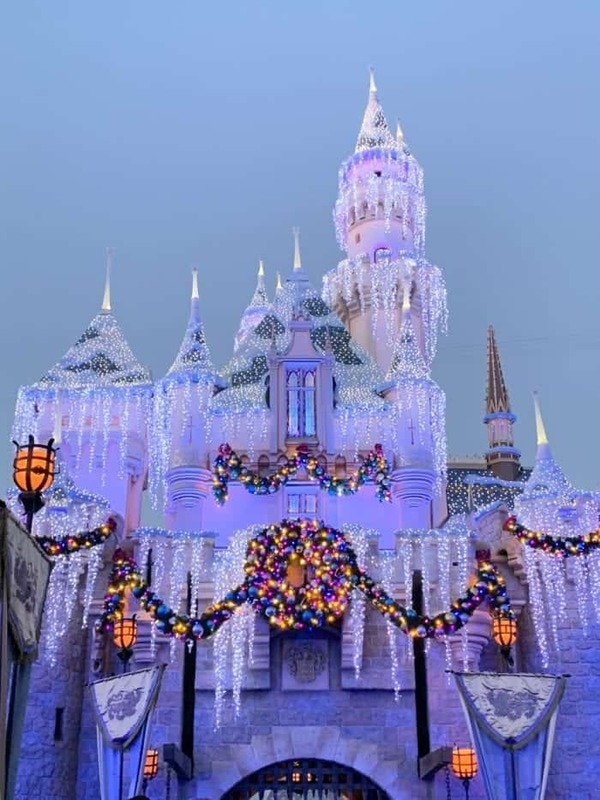 As the sky overhead lights up with dazzling color, more than 80,000 twinkling lights illuminate Sleeping Beauty’s Winter Castle with sparkling “icicles” and shimmering snow-capped turrets. and Wintertime Enchantment at Sleeping Beauty’s Winter Castle! As a special wintry treat, experience a magical snowfall all around you when you head over to “it’s a small world” Holiday in Fantasyland, over portions of Main Street, U.S.A. and near the Rivers of America! 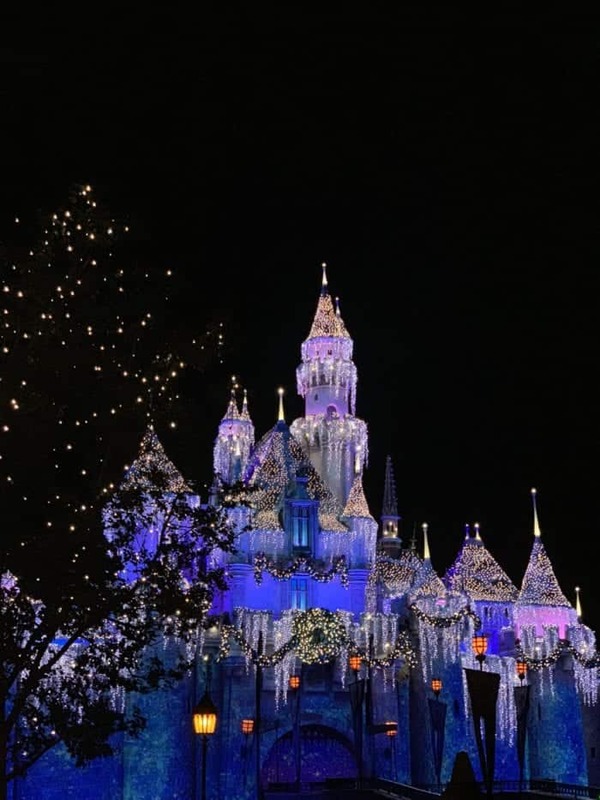 Wintertime Enchantment at Sleeping Beauty’s Winter Castle is phenomenal! Each evening, gather to watch as the iconic edifice shimmers to life. With snow falling and music filling the air, behold thousands of twinkling lights, illuminated in stages. It’s absolutely stunning. Over in Critter Country, near Pooh Corner, Santa is set up ready to meet the kids and get photos taken. We walked right up and had minimal wait. 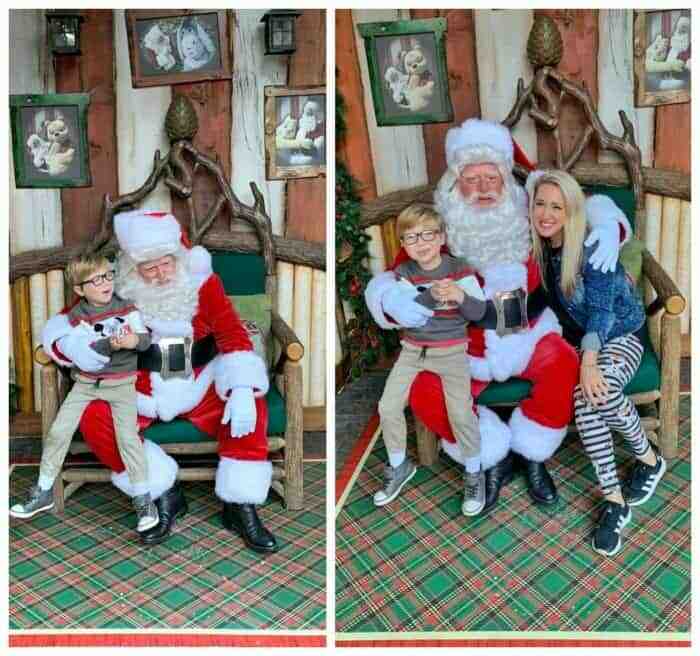 I got some really cute photos of Pax talking with Santa. This is a MUST this time of year. 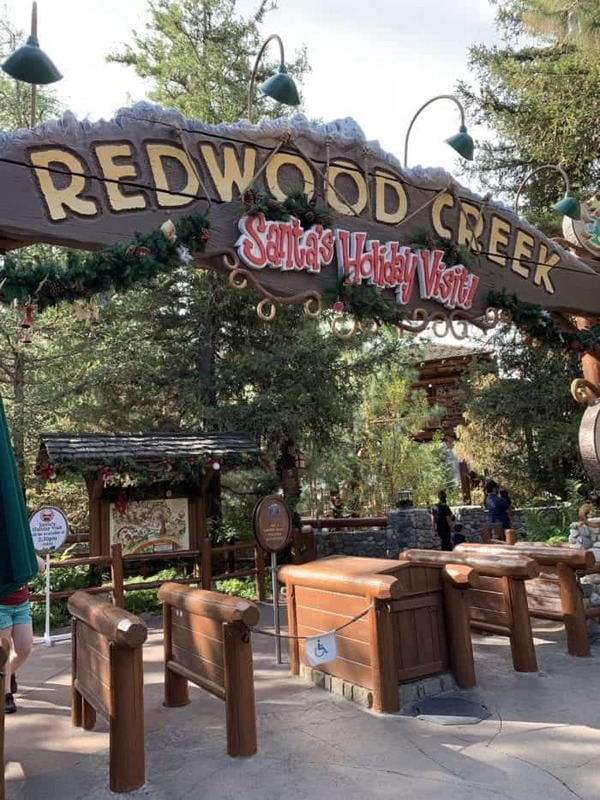 Santa is also at Disney California Adventure Park at Redwood Creek Challenge Trail. 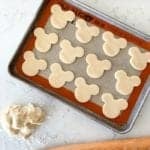 One of my favorite things to do at Disneyland is EAT my way through the Parks. 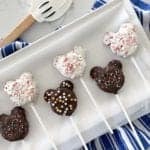 Be sure you check out the BEST Disneyland Food, Holidays 2018. I’ve listed all of the details of the best eats this time of year. Festival of Holidays is also going on this Holiday Season at Disney California Adventure Park. Be sure to check out the Marketplaces around the Park for some amazing food options! 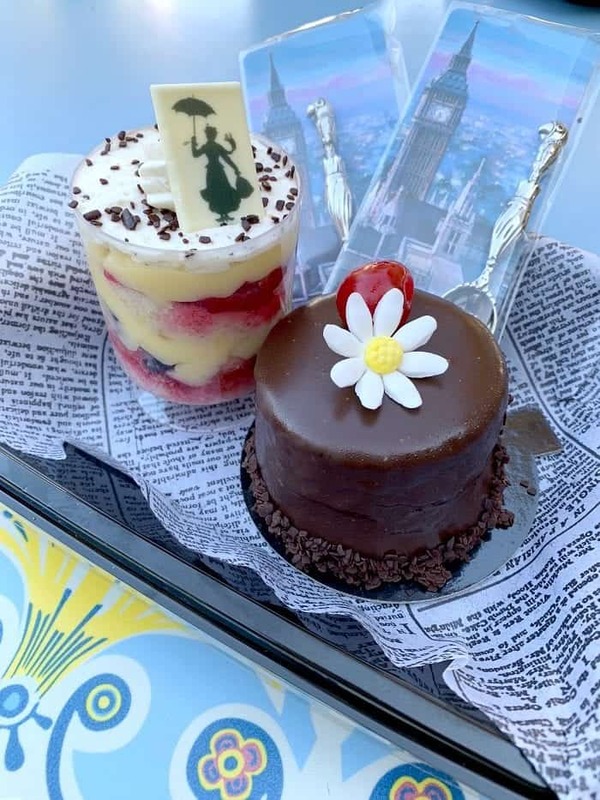 Pax and I tried the new Mary Poppins desserts from Jolly Holiday Bakery Cafe. They were AMAZING and come with a little spoon to take home. Highly recommend both of these. Make sure you check out all of the Holiday merchandise available around the Parks. 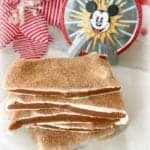 It’s really adorable….and trust me you are going to want everything, ha! Even if you are window shopping, go check out the cute things. 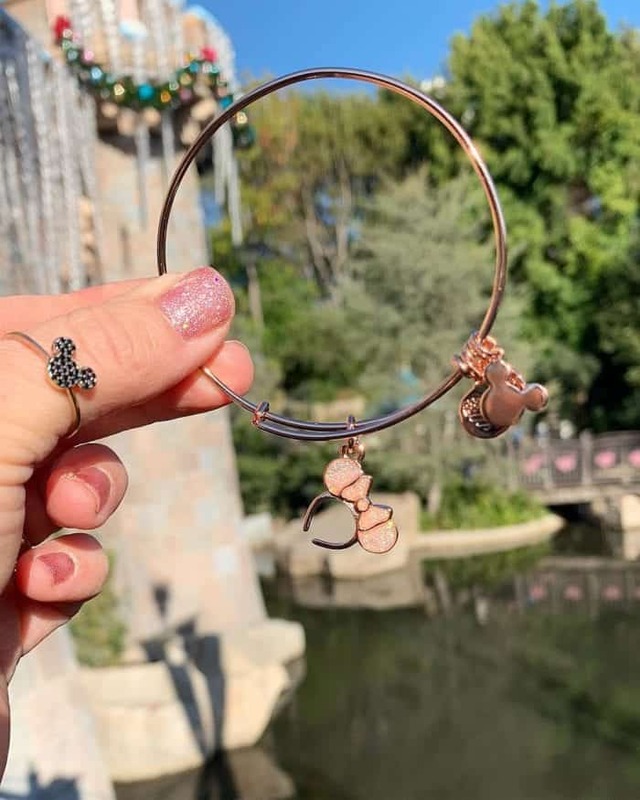 This is the new Alex and Ani Minnie Headband bangle that was just released. It is stunning! Found it at World of Disney, Downtown Disney for $44.95 before AP Discount. 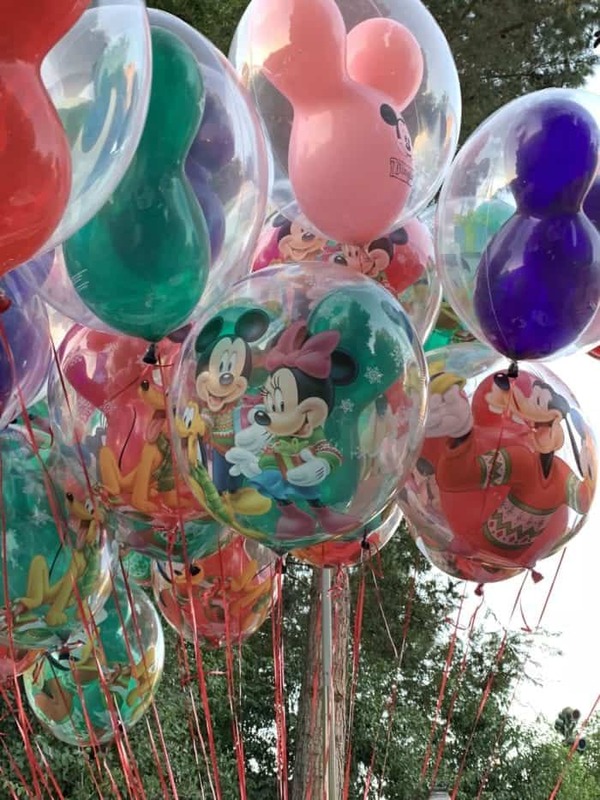 These new Holiday Balloons are the cutest. They light up at night and run about $15. The cast members that sell the balloons only take cash for your reference. 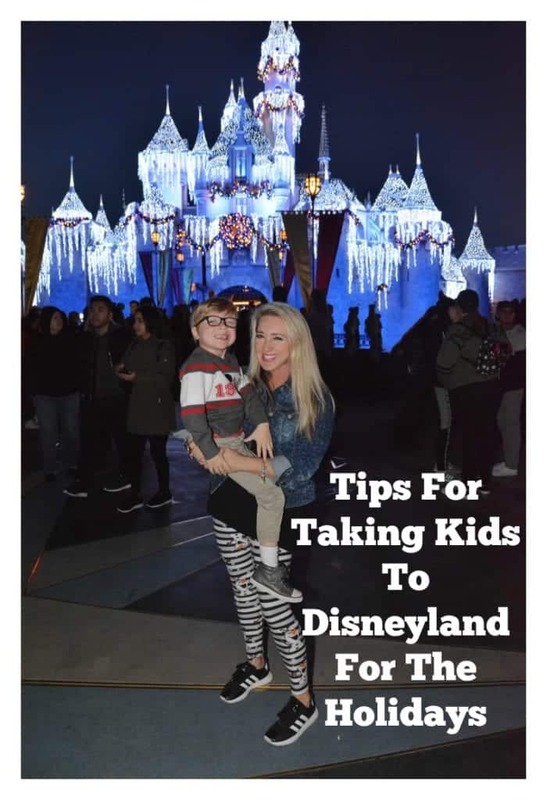 Hope you’ve enjoyed my tips for taking kids to Disneyland for the Holidays. There’s so much to do and magic to see, enjoy every minute!